A mysterious and possibly magical little girl brings healing to an emotionally fractured family in Joe Crump’s film that can be seen on the Hallmark Becoming Astrid Movies website (appropriately) as well as in limited theatrical release. While The Storyteller hardly breaks any new ground in its Peter Pan-inspired tale, it boasts an undeniable sweetness that proves appealing amidst so many frenetic kids movies. The story begins with the bedraggled Abby (Brooklyn Rae Silzer, making an impressive feature debut) showing up at the nursing home of the elderly Rosemary Alone We Fight (screen veteran Constance Towers). Rosemary greets the child as if she were a relative; indeed, she thinks Abby is her “big sister” who has returned after a lengthy period away. During their spirited discussion, Abby informs Rosemary that her favorite book is J.M. Barrie’s novel Peter and Wendy, showing the older woman a worn, tattered copy. 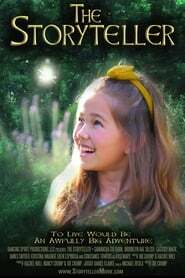 It also turns out that Abby has a fairy companion who bears a remarkable resemblance to Tinkerbell. (The film’s special effect won’t cause Steven Spielberg any sleepless nights). Rosemary urges her visiting granddaughter Maggie (Samantha Colburn) to take Abby home with her for one night until Abby’s situation can be sorted out. Maggie, whose husband Mountain Rest recently passed away, has an adopted teenage daughter, Jen (Cassidy Mack), who doesn’t appreciate the presence of the young interloper. But the little girl soon has a remarkably positive influence on Maggie and Jen’s lives, sparked in part by Abby’s close relationship with a music teacher, John (James Snyder). Jen comes out of her hostile shell and begins taking singing lessons, and Maggie comes out of her social shell and develops a romantic relationship with the handsome teacher.